a scene from Casey Neistat’s video. You can see another 360-degree 4k video sample from the soon-to-be-released Samsung Gear 360 camera. 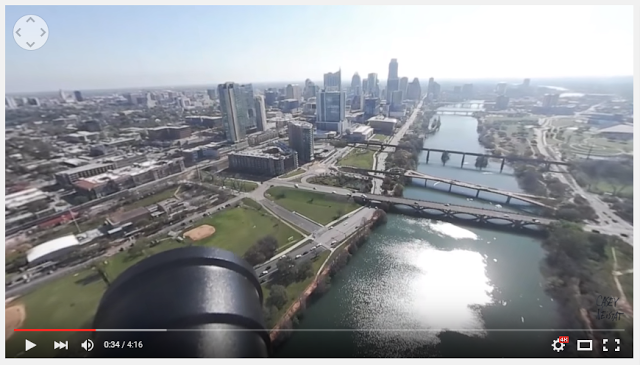 The video is by YouTube celebrity vlogger Casey Neistat, and features some aerial shots, shots of him as a panelist at a Samsung event, and other scenes. Note: on YouTube, you need to select the highest video quality by clicking on the gear button. On a desktop, the resolution is up to 4k. On a smart device, the resolution may be limited to 2k. Casey has previously posted a 4k 360 video with the Samsung Gear 360 at the Oscars. Casey has been an avid proponent of 360 video and his first 360 video (with the Theta) has over 3 million views.